Have you ever eaten a REAL Sloppy Joe? I don’t mean the ground beef and tomato sauce sandwich. I am talking about the classic and delicious double-decker deli sandwich that beautifully combines two meats, Swiss cheese, coleslaw and Russian dressing on rye bread. The origin of this sandwich begins in Havana, Cuba. It was the 1930’s and the small North New Jersey town of Maplewood was led by Mayor Robert Sweeney, an animated politician who loved fishing, gambling and drinking in Cuba. He was especially fond of a tavern they called Joe’s. Joe, the proprietor this Havana tavern, was well known for his inability to keep a clean bar. He was lovingly given the nickname “Sloppy” Joe by staff and patrons. While the Mayor was at Joe’s in Cuba, he had a sandwich unlike anything he had before. It was made with cole slaw, ham, cow tongue, Swiss cheese, with lots of dressing served on thin rye bread. When he returned home, he asked the owners of Maplewood’s Town Hall Deli to duplicate the recipe. 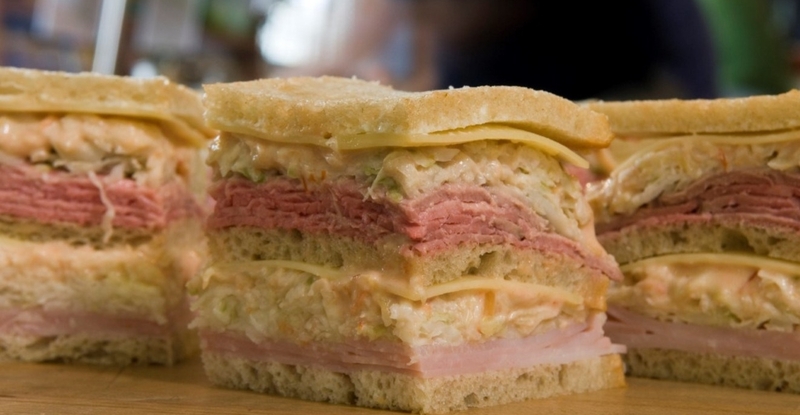 Their Town Hall Deli version recipe was adjusted to use turkey and corned beef. Below is recipe that is based on my fond memories eating this glorious sandwich at the Town Hall Deli while attending Seton Hall University, located right down the street in South Orange NJ. It’s time consuming to make, unhealthy, doesn’t refrigerate well, and is messy to eat. However, if you are looking to eat a sandwich that will blow your guests away or want to creatively use corned beef for your next St. Patrick’s Day party, look no further than the REAL Sloppy Joe Sandwich. And please, don’t use store bought condiments for this beauty. Make your own coleslaw and Russian dressing and your taste buds will thank you.